With her experience in health systems administration, Vanetta Abdellatif is at the helm of creating lasting and sustainable change in delivering care to communities of color and underserved segments in Multnomah County. As the Director of Integrated Clinical Services at the Multnomah County Health Department, Vanetta oversees medical, dental, school-based health centers, as well as ancillary services such as radiology, laboratory, WIC and more. More recently, Vanetta was in charge of leading the county’s Electronic Medical Records (EMR) Implementation Team, which worked to bring information systems in place for area clinics. Protecting health records and operational efficiency were the main drivers to implementing EMRs in county clinics. Geographically, Multnomah County is the smallest Oregon county, yet it contains approximately 20 percent of the state's population due to the high density found in Portland and the surrounding cities. Its diverse population includes 10 percent Latino; 6 percent Black; and 6 percent Asian (2005 U.S. Census Bureau estimates). Managing the county’s health clinics to enhance services to a diverse population has been rewarding for Vanetta, who has always followed her passion for health care. Her undergraduate coursework consisted of courses toward a degree in physical therapy. After working as a staff member for a health care administrator, Vanetta soon found her niche. “As a health care administrator, one has a systemic approach about impacting health outcomes. I realized that I wanted to have more of an impact on a larger cluster of people, thus my interest in public health,” she said. After obtaining her master’s in public health degree from San Diego State University, Vanetta spent two years with Kaiser Foundation Hospital as an administrative fellow, she then left California to manage health facilities for Catholic Health Corp. That work soon led her back to the West Coast – in Portland, where she began working for Legacy Health System, as an administrator for a program that provided residential treatment for substance-abusing African-American women. “That was a very interesting job. Part of the reason why I got into health care was to make a difference among people of color I felt that I made a lot of difference,” she said. Transitioning to Providence Health System, Vanetta managed two family practice clinics whose patients are enrolled in the Oregon Health Plan, the state’s Medicaid health plan. When Providence Health Plans ceased taking OHP patients for a short period of time, Vanetta became familiar with services offered by CareOregon, the largest OHP administrator in the state. “Our providers really liked working with CareOregon. They talked about how well they understood the clientele, and about how it’s a big help that CareOregon would always step up to help manage care for patients,” she said. 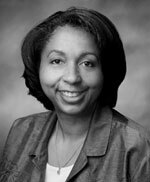 For Vanetta, advocating for the health care needs of disadvantaged and underserved communities is central to her work. Her cultural background plays an important role in her effectiveness at working toward improving health care access for all county residents. In addition to her role at the county, Vanetta also is chair of the governing board for the Oregon Primary Care Association (OPCA). The group provides advocacy on public policy and assistance to members to help decrease health disparities and increase access to comprehensive health care for low-income and vulnerable people in Oregon. Vanetta has served on the OPCA board for four years, and took on the chair position this year. She is the first African-American woman to lead the organization. “OPCA has been a support for communities we serve through safety net and community health centers. My role is to help us strengthen our visibility in Salem, and that we’re able to make some changes that will have a positive impact on our financial sustainability for community health centers, and also our ability to continue to provide quality care for people that we serve,” she said. Effective systems design is crucial to the implementation success of any project. For Vanetta Abdellatif, Director of Integrated Clinical Services at the Multnomah County Health Department, being at the helm of implementing an electronic medical records (EMR) system has been a challenging and rewarding undertaking.